Gas prices could be heading higher than government forecasters expect as Brent crude oil prices flirt with levels not seen since March 2012. Strikes in Libya and other supply disruptions have pushed Brent well past $112 per barrel, dragging WTI futures for January with it. WTI closed north of $96 per barrel Tuesday. The recent upward turnaround in gas prices has begun to do another about-face, although the rise in fuel costs for some has continued past the Thanksgiving travel period. The lingering high prices and price increases continued to affect mainly the East Coast region, while most other areas saw prices level off or return to the declines that were enjoyed during October and the start of November. 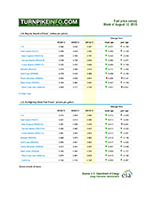 The declines may not last, however, if futures prices continue their unabashed escalation. The latest weekly survey from the U.S. Energy Information Administration shows the average price of a gallon of unleaded gas is now at $3.27, down from $3.29 last week but still six cents higher than the seasonal and yearly low that was enjoyed two weeks ago. The average price of diesel continued upward, and at a more brisk pace, during the past week. The average price of a gallon of fuel is now costing truckers $3.88 at the national level, but regional prices are as high as $4.06. Drivers in New England, broadly, in the east and California, specifically, on the west coast were paying the highest prices. The lowest diesel prices were to be found on the Gulf Coast, but prices there are still averaging about $3.78 per gallon. The price of crude oil has been quite mixed lately, and Brent crude has been heavily influenced by supply problems originating in Libya. An EIA report issued just before the Thanksgiving holiday showed the continued strikes at loading ports have depressed Libyan crude supplies by about one million barrels per day. Indeed, the price of Brent has remained above $110 per barrel since November 21, peaking at prices not seen since August, when other supply disruptions in Libya affected the price of overseas crude. 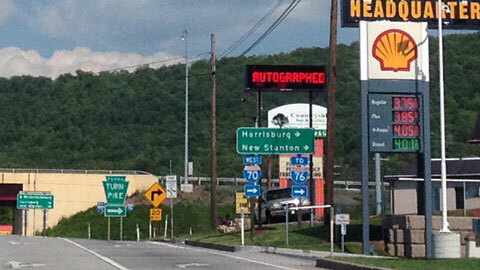 Breezewood, Pennsylvania in May 2012, two months after the Brent futures’ last mad dash into territory above $112. However, the markets took a new turn Tuesday afternoon as when Brent crude closed significantly above $112 for the first time since early 2012. Tuesday trading at the New York Mercantile Exchange brought a fresh price levels and pressures as the benchmark commodity flirted with the $113 level before retreating some later in the day. Brent crude has only been that at that level or higher on three brief occasions in the past three years, with March 2012 being the last time the commodity has priced so high. 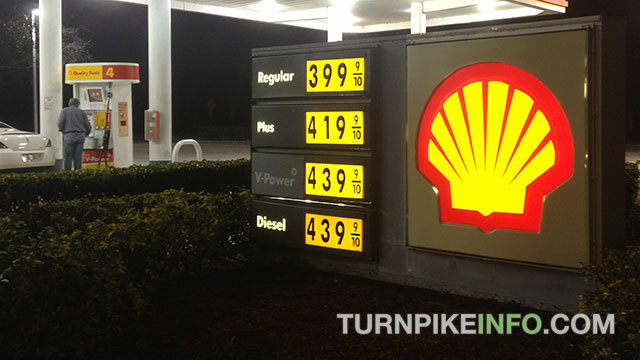 The cost of gas at the pump, during the late spring of 2012, reflected that pricing pressure. Domestic crude, West Texas Intermediate, has also been under price pressure of late, and Tuesday’s trading session pushed the WTI dramatically higher in the wake of Brent’s Monday and Tuesday closings. WTI for January delivery swelled well past $96. WTI had been on a longer-term downward trend, closing even as low as $91.77 per barrel the day before Thanksgiving. The price of WTI on the New York Mercantile Exchange was at $96.12 per barrel on Tuesday afternoon, just at 4 p.m., the first time since Halloween prices have been so high, and an increase of $4.35 per barrel, or about 5%, in just three trading sessions since the holiday. Nevertheless, the EIA has maintained its forecast that January 2014 prices will rise, but only as a short-term event as season supply and refinery adjustments are made. The longer-term forecast is for consumer prices of gas to continue sliding lower during 2014. However, prolonged supply issues in Libya and Europe could impel traders to drive futures further upward, which is not originally a part of the EIA forecast. The price disruptions on the futures markets, as have happened in the past few days, are not likely to leave consumers unaffected. The questions only will be whether crude prices level off, and if they do not, will retailers hold off hiking prices until after the holiday season? If retail distributors and operators anticipate significant supply cost increases in January, they could begin raising prices weeks before January deliveries get underway.